So, I’ve been writing lately about my new class that I’m developing for next year called Make Writing. I’ve been writing curriculum for this class that leverages 3D printing in order to teach Literacy and Writing. The class itself is made up of many of our students who have, up until now, been detached from more traditional education. They are the ones at risk for dropping out. They are the ones being left behind by life. My school, however, wants to attack their disengagement in a different way, and that’s where this class comes in. We’re hoping that the Making aspect of this class helps to make learning more meaningful, more hands-on, and overall, more engaging. After all, student engagement is the key. As Kelly Gallagher says, Engagement first, then Content, then Rigor. I’ve also written about the challenges of learning 3D printing myself. You see, I’m leveraging my own ignorance as a model of how to learn, and the kids are finding that I learn this tech far slower than they do. But while the hardware is out of my wheelhouse, Language Arts is not. So I’ve begun developing the lessons that will become our benchmark writing assignments, ongoing journal prompts, as well as informal and formal assessments for the next school year. Here is the lesson, the standards it hits based on 8th-grade Literacy and Writing, and a student sample to help you model for your students. I picture it as an ongoing assignment that students contribute to as failures happen. 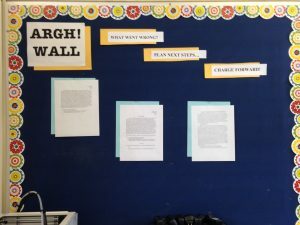 It’s a wall of student work that rotates depending on the projects that are under way and the progress that’s being made on any given piece of work. It’s a way for them to reflect, plan a next strategy of attack, and be assessed on constructed response writing. You can also access the file to make your own copy at www.tinyurl.com/ArghWall. Overview: In this writing assignment, students will adopt a growth mindset by celebrating their failures through reflection and challenging themselves to come up with next steps. As students work using 3D printing, it is not uncommon to fail. With each failure, however, students should be encouraged to look at the steps it took to create the print, note what worked, and propose tweaks to the process before getting back up again. Main Topic Sentence – What went wrong? Evidence of failure – What specifically happened that led to the failure of the print? What problems could you observe in the outcome of the print? (hairy printing, stringing, didn’t stick to the bed, etc…) You can include a photo, descriptions of your observations, specific descriptions of what you attempted (numbers from the tablet) as evidence. Conclusion – How can you move on? Finally, the student should end on 1-3 bullets to propose next steps. CCSS.ELA-LITERACY.RL.8.1 – Cite the textual evidence that most strongly supports an analysis of what the text says explicitly as well as inferences drawn from the text. CCSS.ELA-LITERACY.W.8.2 – Write informative/explanatory texts to examine a topic and convey ideas, concepts, and information through the selection, organization, and analysis of relevant content. CCSS.ELA-LITERACY.W.8.2.A -Introduce a topic clearly, previewing what is to follow; organize ideas, concepts, and information into broader categories; include formatting (e.g., headings), graphics (e.g., charts, tables), and multimedia when useful to aiding comprehension. CCSS.ELA-LITERACY.W.8.2.B – Develop the topic with relevant, well-chosen facts, definitions, concrete details, quotations, or other information and examples. CCSS.ELA-LITERACY.W.8.2.C – Use appropriate and varied transitions to create cohesion and clarify the relationships among ideas and concepts. CCSS.ELA-LITERACY.W.8.2.D – Use precise language and domain-specific vocabulary to inform about or explain the topic. CCSS.ELA-LITERACY.W.8.2.F – Provide a concluding statement or section that follows from and supports the information or explanation presented. CCSS.ELA-LITERACY.W.8.10 – Write routinely over extended time frames (time for research, reflection, and revision) and shorter time frames (a single sitting or a day or two) for a range of discipline-specific tasks, purposes, and audiences. You know, I’d expect these magical “voodoo” like printers to do an extraordinary job with making my invention, but when I first saw the print out, I didn’t see my invention in all its glory–instead, I got a flippin’ hairy box looking back at me. Unnecessary filament strings hanging everywhere. Come on, this ugly thing isn’t even mine! This print was supposed to be a 3D prototype for my invention (for the Invention Convention), but I can’t even use this. As a matter of fact, my invention is supposedly going to be manufactured with a 3D printer, but after seeing this, I’m very discouraged to do so. After doing some research, thank you very much, I found out that this was a problem that many printers have, known as “stringiness”. It seems to be caused by nozzles that move too slow and temperatures that are too hot. After seeing this, we attempted to change the nozzle temperature to 210 degrees and the build plate temperature to 70 degrees, but the results varied with different types of filament. For example, the red filament seemed to produce perfect results, but the blue and silver (especially silver) had not-so-great prints. Does this mean that the filament itself contributes to stringiness? Perhaps different colors call for different settings? Next, we decided to reprint my invention once more (with the red filament). The results did not meet to my expectation, but it was better than before. Still, there are strings…ARGH!!!! I suppose I could continue to tinker around with the printer’s settings to get a perfect print or I could simply use something else to make my 3D prototype. Turn the nozzle temperature down to 180 degrees. Change (increase) travel speed to 250mm/m. Change the filament–after changing the nozzle temperature to 210 degrees and the build plate temperature to 70 degrees, I think the problem might be in the filament. “A Visual Ultimaker Troubleshooting Guide.” – 3DVerkstan Knowledge Base. Web. 30 Mar. 2016. ??????? coach yahoo???? - ??????? coach yahoo???? ??????Titoni???????????????????????????????????????????????????????????No . 1???1???????????????????????????????????????????????????????????????????????????????????????1?????????????????????????????????????????????????????????????????? ?